Pappy Van Winkle 20 and Jefferson’s Presidential 21 could be meeting a new kind of match as Heaven Hill Distilleries tells BourbonBlog.com that they will release the new 21-Year-Old Elijah Craig Single Barrel to select markets across the country in August 2013 for $140 / 750 ml bottle. BourbonBlog.com is the first media outlet to bring you a review and news on this special release. 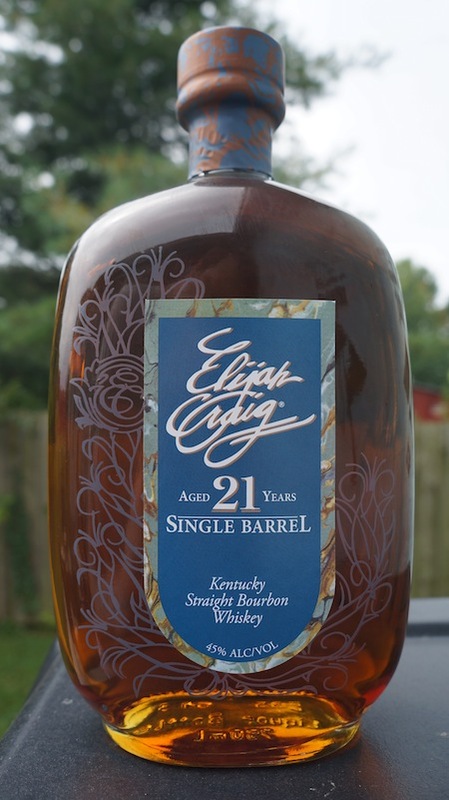 We also were the first to tell you about the 20-Year-Old Elijah Craig Single Barrel as it replaced the Elijah Craig 18-Year-Old in May of 2012. This limited-edition Elijah Craig 21 has previously only been available at the gift shop of the Bourbon Heritage Center in Bardstown, Kentucky. Is this 21-Year-Old worth it for $140 a bottle for your collection and the hunt? For loyal followers of the Elijah Craig line who long for cooperage, absolutely. Elijah Craig 21 will be a great addition for the collection which aims to showcase varying ages and expressions. However, if you want a Bourbon to speak age in a bold fashion, another Bourbon may be a better choice. Keep in mind that Elijah 21 is more about elegance and a refined aged flavor. Once the allocation of Elijah 21 is sold out, Heaven Hill says no more will be available. If you’re a fan of Elijah Craig 18, 20, you should enjoy 21. The notes have change a little between each expression of age.